A very old English cider apple which originated in the 19th century in Yarlington, West Cadbury where it was found growing out of a wall near a water wheel. It produces a fine bittersweet cider with a good aroma and flavor. 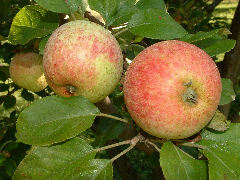 Fruit is small with pale yellow skin overlaid with light red striping. Ripens late October to November.